New Rochelle, NY, March 29, 2018–A new study has definitively shown that a single treatment with gene therapy using adeno-associated viral (AAV) vector gene delivery to replace the defective gene responsible for congenital adrenal hyperplasia (CAH) will only temporarily alleviate the hereditary disorder. The normal cells will eventually be replaced by new adrenocortical cells carrying the disease mutation, and a long-term solution will require targeting the genetic mutation carried in a patient's adrenocortical stem cells, as reported in an article published in Human Gene Therapy, a peer-reviewed journal from Mary Ann Liebert, Inc., publishers. 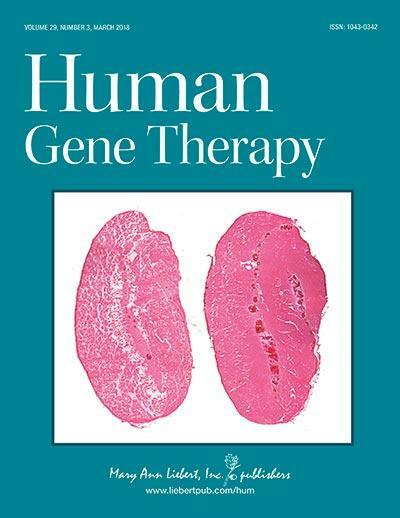 The article is available free on the Human Gene Therapy website until April 29, 2018. Sandra Markmann, Ronald Crystal, and a team of researchers from Weill Cornell Medical College, New York, NY coauthored the article entitled "Biology of the Adrenal Gland Coretex Obviates Effective Use of Adeno-Associated Virus Vectors to Treat Hereditary Adrenal Disorders ." The researchers demonstrated that the loss over time of therapeutic genes delivered by AAV vectors was not due to an immune response against the AAV delivery vehicles and was instead a result of the renewal of adrenocortical stem cell populations. "There has been a growing trend in gene therapy to target diseases identified by newborn screening. CAH screening has been included in the U.S. for decades, with corticosteroid replacement being the only therapy," says Editor-in-Chief Terence R. Flotte, MD, Celia and Isaac Haidak Professor of Medical Education and Dean, Provost, and Executive Deputy Chancellor, University of Massachusetts Medical School, Worcester, MA. "Defining the limitations to AAV gene therapy in such disorders is an important step, much as was the early gene therapy work in cystic fibrosis. Such studies, even though they show limitations, move us closer to identifying the right solution for these patients."